Hunan Province is in central China, south of the Dongting Lake. It is famous for the beauty of its landscapes. The Yangtze River flows through the many mountains that delineate a region full of natural sites off the beaten track. 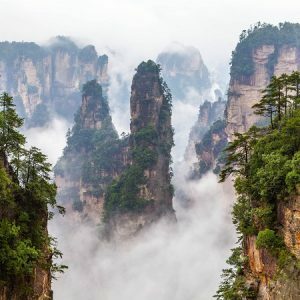 In 1982, Zhangjiajie National Park was the first national park established in China. The work of nature is exceptional. The sandstone karstic peaks with equally ubiquitous shapes rise up high in the sky. Mount Wulingyuan will certainly be the highlight of your stay. Fenghuang is a small town with obvious historical appeal, with its old houses along a beautiful river. For hikers, Dehang is the ideal starting point to meet the Miao minorities. The capital, Changsha, and Zhangjiajie City both have an airport. There are flights from the main cities of China. Railroads crisscross the entire Hunan region and thus facilitate journeys from one city to another. When to travel to Hunan? The subtropical climate of Hunan makes the summer very humid and stuffy. The monsoon season is therefore to be avoided. It is more advisable to focus on the months of September and October for a stay in the region, if not spring. Temperatures are more bearable and the showers are more rare.